OUAGADOUGOU (Reuters) - In the sulphurous stench of a Ouagadougou tanning factory, leather technician Riyaz Kamal checks the thickness of a goat hide which may end up as a pair of Italian designer shoes. Kamal is one of three Indians working at Burkina Faso's only tannery who left their homeland for a country ranked the world's second least developed by the United Nations, lured by the prospect of higher pay. "In India you have to get more experience -- experienced technicians only can get more money there. So here I'm getting more than I can earn in India," said Kamal, whose income at the Tan-Aliz plant is nearly three times what he earned in India. The firm and its 300 workers are part of a lucrative global trade, supplying some of the biggest fashion labels including Italy's Gucci. 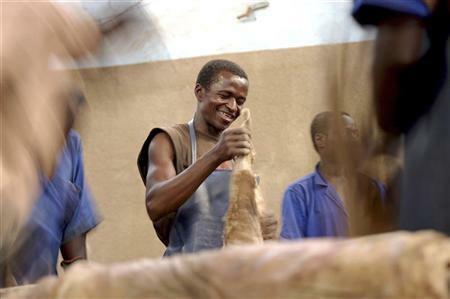 However, the global downturn has sent demand for luxury products tumbling and Burkina's nascent leather industry is feeling the effects of the credit crunch. "There is a lot of reduction in demand ... because of that even I have huge stock here, which needs to be sold," said Tan-Aliz's general manager, Mahanmadou Ouedraogo, sitting on a pile of neatly bundled white sacks lying unsold. When the Group of 20 world leaders met in London in early April to discuss their response to the economic crisis, critics reminded rich governments they must not abandon the poor countries that will feel the brunt and are likely to face rising poverty and social unrest. The World Trade Organisation has forecast global commerce will shrink by 9 percent this year, its biggest contraction since World War Two, because of falling demand. Moving to this hot, dusty and landlocked country was a leap into the unknown for the three Indian leather experts. They packed Spanish phrasebooks only to discover that Burkina Faso -- a country they had never heard of -- speaks more French. They struggled over how to pronounce their new city's tongue-twisting name: "Wa-ga-du-gu". It is a far cry from the leather industry they grew up with in India, where the city of Chennai alone has nearly 1,000 tanneries and shoe factories. In Burkina, Tan-Aliz is the only one and it does not yet produce shoes. Its hides may come from village goats and sheep, but they go to some glamorous destinations: between 70 and 80 percent are exported to Italy, and a small quantity to Spain and India. Tanning is an important chance to earn foreign revenue for the poor former French colony, which depends mostly on cotton. Tan-Aliz, the largest leather plant in this part of West Africa, processes 25,000 skins a day and turns over 5 billion CFA francs a year, mopping up 85 percent of all Burkina's goat and sheep skins. Ouedraogo has limited options for weathering the economic and trade crisis. He hopes to develop finished products for the local market, such as shoes, sofas and briefcases, but for now domestic buyers make up only 3 percent of the market. There is not a customer in sight at the Tan-Aliz factory boutique, filled with bags etched with images of local drums and brightly coloured sofas too expensive for most people here. Despite the downturn, the factory is so hungry for more and better skins -- it is not currently reaching its capacity of 30,000 a day -- that it is even setting up in Niger, too. As with many industries, he hopes the answer to his problems may lie with Asia. "China, definitely, also can give us a new opportunity because it is a huge market, and you have also the possibility to sell a range of articles," he said. Growing the leather industry should help reduce Burkina Faso's dependence on cotton farming, which makes it especially exposed to market fluctuations. Cotton prices have nearly halved in the past year because of global uncertainty. "There is a need, a very acute need, for the economy to get transformed and to get diversified in order to cushion against this vulnerability," said Galina Sotirova, country representative for the World Bank. Livestock and associated products already account for 10 percent of the country's gross domestic product and are the second largest source of export income after cotton, accounting for 25 percent of the country's total exports. "The skins industry profits the nation greatly -- the state just as much as the population," said Smalya Traore, a factory employee sorting through incoming skins in the open air before sending them into the factory for treatment. The Indian workers are happy to be here, too. "My boss is taking care of us Indians here. He has given everything to us, more than what we expect," said Kamal, explaining that, while Indian employers yell a lot, his Burkinabe boss has never raised his voice. Kamal and his two Indian co-workers, part of a 150-strong Indian community, cook curry at home and regularly go to see Bollywood movies in cinema-loving Ouagadougou, which hosts Africa's FESPACO film festival every two years. "In another country we are watching our Indian films, so it boosts us," said Kamal, whose wife has just given birth thousands of miles away and who sent pictures of his baby via the Internet. "It feels just like we are in India."